It’s always fun to stumble upon public works of art. 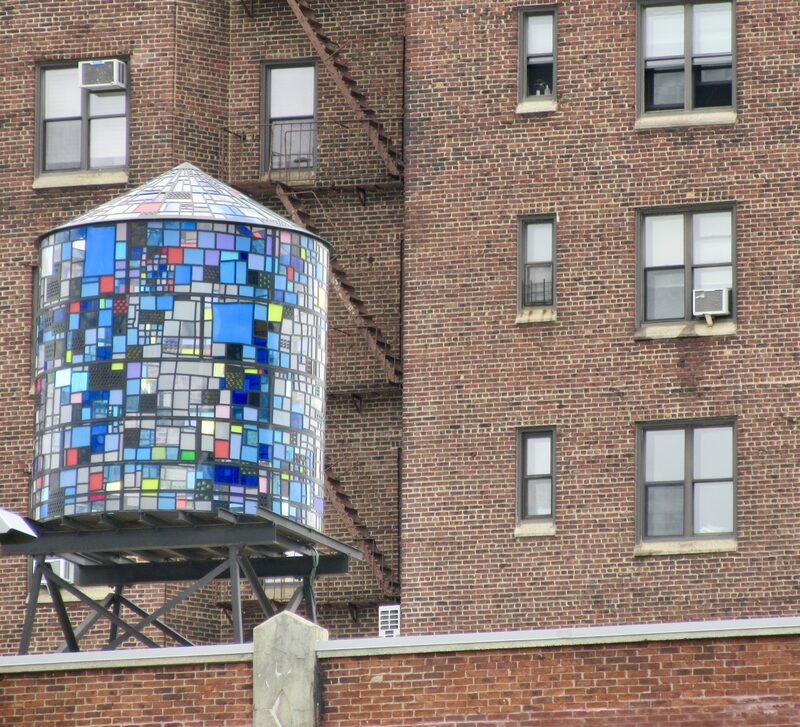 When I saw photos on the web of Tom Fruin’s Watertower – which looked like a Mondrian painting in the sky to me – I knew I had to see this gorgeous sculpture in person. Geoffrey and I headed out to Brooklyn early yesterday evening with an idea to catch the sculpture both in natural daylight and perhaps also after dusk, since it is illuminated from within by artificial lighting and obviously looks amazing. We took the 8th Avenue line from Manhattan to the first stop into Brooklyn (High Street – Brooklyn Bridge) and walked north toward the water as Cadman Plaza turns into Washington Street, and Washington then Ts off into Plymouth street, where you’ll find the beautiful, riverside oasis known as Brooklyn Bridge Park, just adjacent to the Manhattan Bridge. 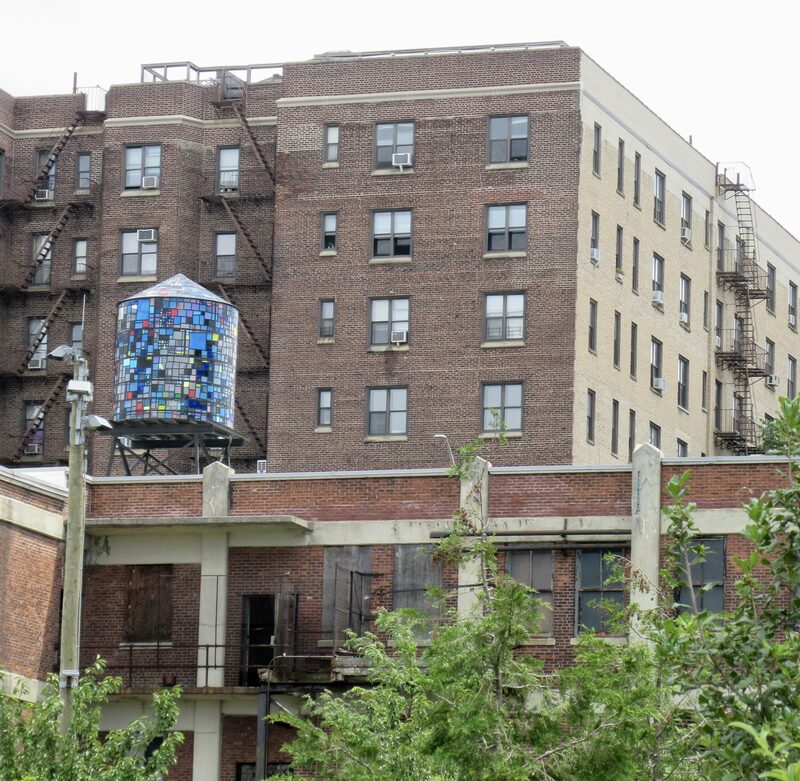 Viewed from the ground, the Water Tower can be best seen from the park, but be aware that you won’t be able to get as close to it as you would think by these photos, which were taken with a zoom lens. And because the Tower is on top of a building, it disappears as you get closer. But it’s totally worth the price of a round trip subway ride and there are tons of cool little boutiques and restaurants, as well a thriving gallery scene, in that neighborhood, so why not make it destination trip one day this summer? 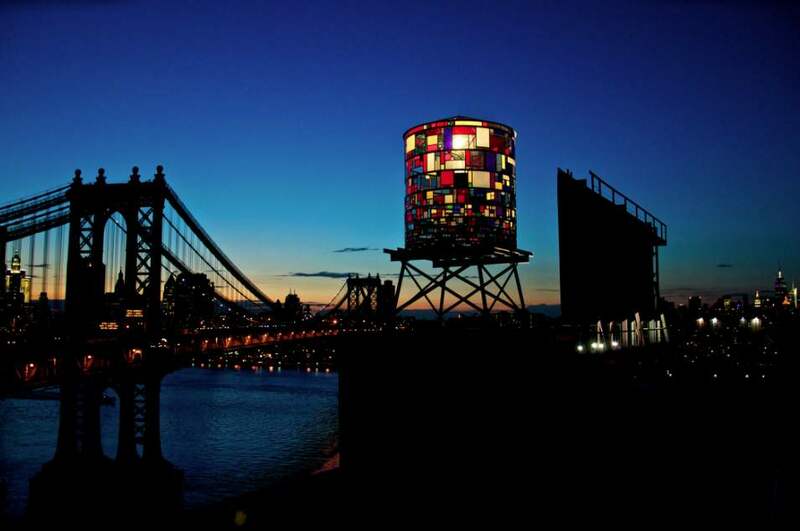 Tom Fruin’s Watertower will be on display until June of 2013. Situated on the rooftop of 20 Jay Street, the sculpture is viewable from the parks and streets of Dumbo, the Brooklyn and Manhattan Bridges, FDR Drive and Lower Manhattan. 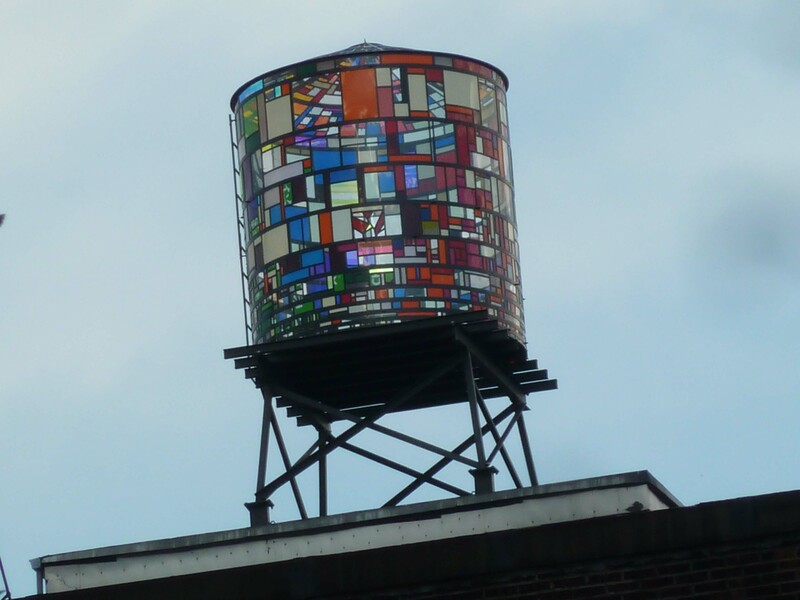 Note: In 2014, Fruin installed second glass water Tower at 334 Furman Street in Brooklyn Bridge Park. I took these photos on July 22nd, 2018, while stand near Pier 6 and facing east. This tower will also be lit up at night!